Spectacular Pool Home with Brand New Custom Windows*This Beautiful Property offers 4 bedrooms, 3 baths, 2,382 square feet and 2 car garage*Ceramic tile throughout main areas*Open concept floor plan that features a kitchen with granite countertops, recessed lights, tile backsplash, pantry, stainless appliances, gas cook-top range and large snack bar that is perfect for entertaining. Easy flow into the family room with double tray ceiling, carpet, recessed lights and ceiling fan. The formal dining room is big enough for family gatherings and has carpet, chair rail and chandelier. *Living room that is perfect for taking in some quiet time * Isolated master suite with carpet, tray ceiling, recessed lights, ceiling fan and private master bath. * Screened-in lanai with pool and covered seating area. 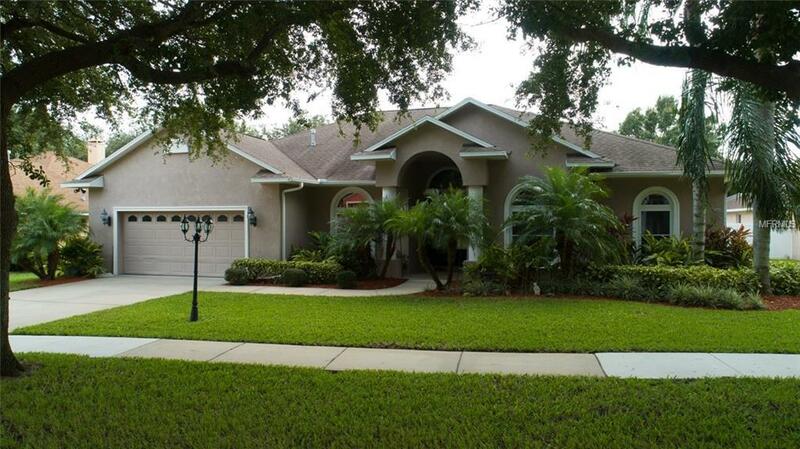 *Sit back and enjoy the private back yard with mature landscaping throughout. *Large deck space for summer parties. * Convenient to schools, shopping and great restaurants. *Easy access to I-75 and crosstown expressway. * Only 45 minutes to Tampa International Airport and *60 minutes to Floridas top vacation destinations, Orlando, Disney. Pet Restrictions Per County Restrictions.